Ka-Boom | Pittenger & Anderson, Inc.
My Dad is a pilot, and a good one at that. He started the learning process back in the late 80s, motivated to find a quicker way to get to our summer cabin in Northern Minnesota (in an effort to avoid the 4 hours of commercial connections from Lincoln – Minneapolis – Brainerd). His first plane was a Turbo Saratoga, which was a single front prop airplane. In the summer of 1994 (I was 15…frontal cortex of my brain not fully-developed yet), he was flying me and four of my friends back from a week up at the lake. There was not but a cloud in the sky, and for an hour or so, the flight was smooth…then, Ka-boom! The engine blew, oil covered the front windshield, smoke billowed out on all sides, and panic set in—for the four teenagers, that is. My dad stayed cool, calm, and collected. He was trained for this; he had a protocol to follow, and that was all that was on his mind. Within a matter of a minute or two, he had identified the closest airport (Omaha) and shut down the electrical power to prevent any issues with the engine from becoming issues INSIDE the plane. At that point, we had no communication to the flight tower and had become a giant hang glider, with no power and no visual out the front windshield. Not too many days later, without asking for my consent, my dad took me back out to the airport. He had rented another plane for the day; we got in and prepared to fly. He talked me through each sound, each instrument, and the main processes and procedures. I listened. He knew how important it was to educate me on the process of flying, and he did not want the recent incident to deter me from flying again. The benefits of flying far outweigh the drawbacks. Worldwide, in 2017, there were only 10 fatal airliner accidents resulting in 44 deaths, which is the safest year on record for commercial passenger air travel. Compare that to 40,100 automobile-related deaths in 2017…and that is only in the U.S.! Statistics aside, the vast majority of people are more comfortable driving. Why is that? Because they are in control. When you fly, you give control over to the pilot. When you drive, you can feel the steering wheel, the brake, the gas, and you can see the flow of traffic. The tires are on solid ground as opposed to being tens of thousands of feet in the air. That said, next time you drive to and arrive at your destination, think back to the ride… What percentage of the time were you fully engaged in the driving process? Conversely, what percentage of the time were you distracted, either lost in thought, finding the right radio station, talking to a passenger…or checking your phone? There can be a risk in holding on too tight and being fully in control. Many of us believe we are great drivers, but statistics would suggest otherwise. And, if we are being honest with ourselves, we are too comfortable behind the wheel, which can lead to complacency and, in turn, accidents. Pilots are professionals, and although it would be unreasonable to think that they are always 100% laser-focused on the task of flying, it’s pretty fair to assume that they are at 90%+. The good pilots are also great communicators. When the ride gets bumpy and the pilot fails to convey what is happening, passenger anxiety rises. Conversely, when the ride gets bumpy and the pilot calmly explains what to expect, everyone relaxes a little. 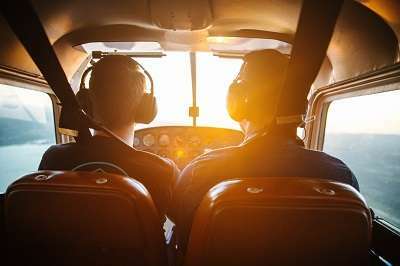 It is reassuring to know that the pilot is aware of the situation, acknowledges it, and has proper procedures and processes in place to handle it. We know that you will feel anxiety from time to time (we feel it, too) because the air does get bumpy when investing in the stock market. Even so, the long-term benefits of investing in stocks far outweigh the drawbacks. That is not opinion; time offers the proof. And, sometimes, it is necessary to fly through choppy air in order to get to a smoother cruising altitude. Over time, we have made significant mid-air course corrections (Bear markets 2000-2001, 2008-2009). We have flown through choppy air (Corrections – 1997, 1998, 1999, 2003, 2010, 2011, 2011 (again), 2012, 2015, 2015 (again), 2018). We have safely landed hundreds of proverbial planes (clients fulfilling on their financial plan and living the life they desire), even after going through course corrections and choppy air. We have seen a small number of clients (2% annual attrition rate, to be exact) parachute out during the tough times (we hope they are doing well). The air is choppy right now. You should keep your seatbelt fastened. But, we are in a stable plane that has been serviced and checked and has pilots at the helm who have been through this before and are paying very close attention. If you need a bit of Dramamine to get through this rough patch, give us a call and we can talk about what that might look like. Otherwise, plug into a good book or movie; we will get you to your destination.